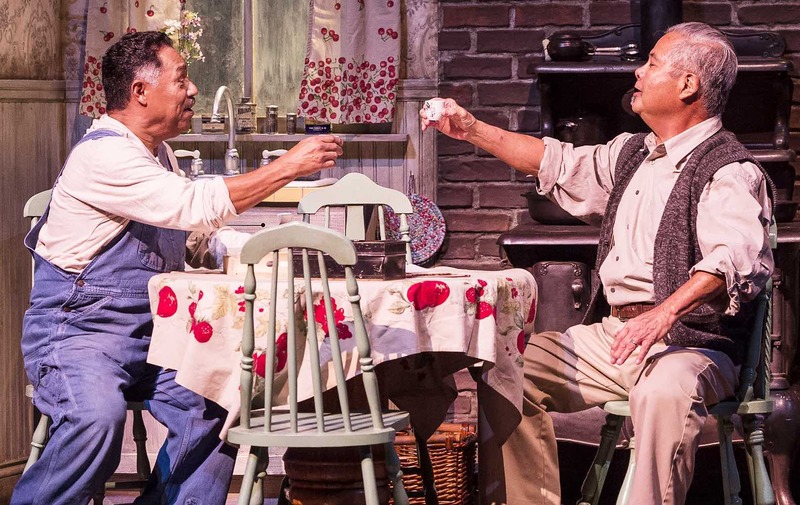 A Japanese American woman and a Mexican American man all in love on the farm that their families share during the Great Depression, but are forced apart by the outbreak of war with Japan and the mass incarceration that follows. 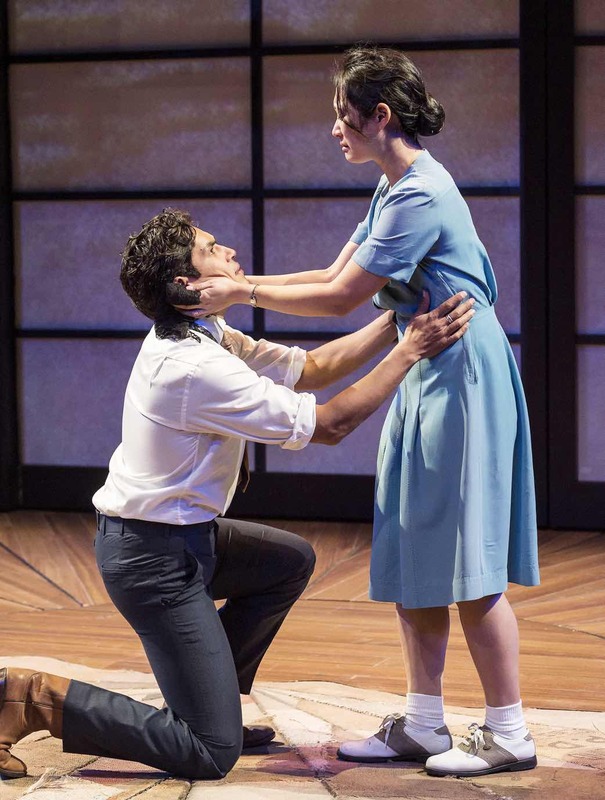 The story is fictional but it rings true for Melanie Arii Mah, lead actress in “Valley of the Heart,” which is running through Dec. 9 at the Mark Taper Forum. 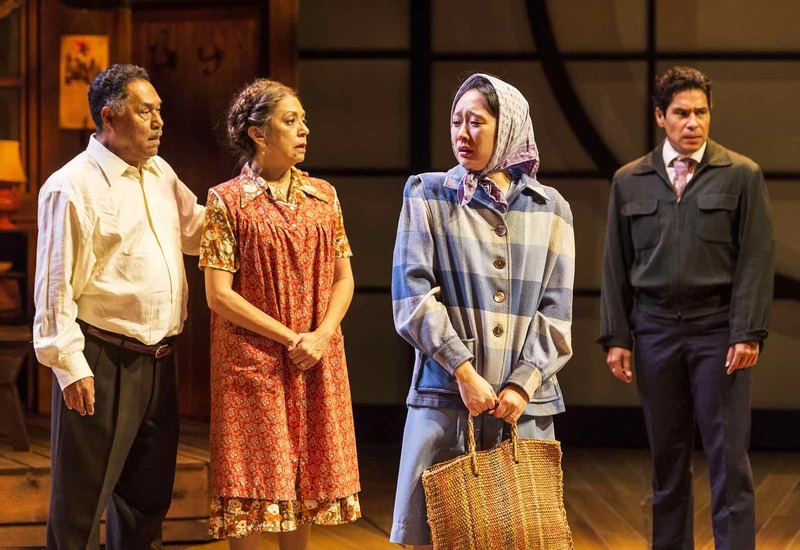 Mah, who first played Thelma Teruko Yamaguchi four years ago in Northern California, is excited to bring the play to Southern California and feels it is more relevant than ever in today’s political climate. This also marks her Center Theatre Group debut. On the Yamaguchi family farm in Santa Clara Valley, located in what is now Silicon Valley, Thelma lives with her Issei parents, Ichiro and Hana (Randall Nakano and Joy Osmanski). Her love interest, Benjamin Montaño (Lakin Valdez), works on the farm with his parents, Cayetano and Paula (Daniel Valdez and Rose Portillo), and siblings, Maruca (Christy Sandoval) and Ernesto (Moises Castro). But Thelma’s parents have arranged for her to marry their friends’ son Calvin Sakamoto (Scott Keiji Takeda). When Pearl Harbor is attacked, Ichiro is arrested by the FBI, and his family is later sent to Santa Anita and then Heart Mountain in Wyoming. Thelma is pregnant with Benjamin’s child, who is named Benjirou. Benjamin tries to visit her in camp as often as possible but is also responsible for running the farm. Meanwhile, Thelma’s brother Joe (Justin Chien) joins the Army to prove his loyalty while Calvin becomes a draft resister. Mah was born and raised in San Francisco to a Japanese American mother and a Chinese American father, attended a French Catholic middle school and Lick-Wilmerding High School, and received her BFA from the Boston University School of Theater. There are “astounding” similarities between the Yamaguchis’ story and her own family history, Mah said. “My Japanese American grandfather and grandmother were born in Martinez, Calif. and Winters, Calif., respectively. They were American citizens who were sent to a concentration camp like Thelma and Joe Yamaguchi. My grandfather (Staff Sgt. Mamoru ‘Mum’ Arii, Easy Company) fought with the 442 Regimental Combat Team and received a Congressional Medal of Honor before he passed away in 2013. Mah started studying Nihon buyo (Japanese classical dance) at age 3 but never thought she would be a professional performer. “I was Wendy in ‘Peter Pan’ in my eighth-grade musical, which I thoroughly enjoyed, but I did not think that I would have a career in the arts. During my sophomore year in high school, I did not make the volleyball team and our acting teacher told me to audition for the fall play. I couldn’t fathom auditioning for or performing in a theatrical play but I was cast and continued to pursue theater for the next two years with the strong support of my parents. Her other stage credits include “4,000 Miles” at Lincoln Center Theater and several plays at Boston University Theatre, London Academy of Music and Dramatic Art, and Adirondack Shakespeare Company. She is also trained in ballet and singing. Mah was living in New York when her aunt Joyce Iwasaki told her that the second production of “Valley of the Heart” was recasting the role of Thelma. “Once she mentioned that Luis Valdez had written a new play about Japanese and Mexican Americans in Northern California during WWII, I immediately sent in my headshot and resume,” she recalled. “I had studied Luis and the Teatro in college and jumped at the opportunity. I was on a plane the next weekend to audition and booked the show. At the Teatro in 2014, Mah did five shows a week followed by a weekend of shows at CSU Monterey Bay. In San Jose in 2016, she did six shows a week. Both runs lasted for about two months. 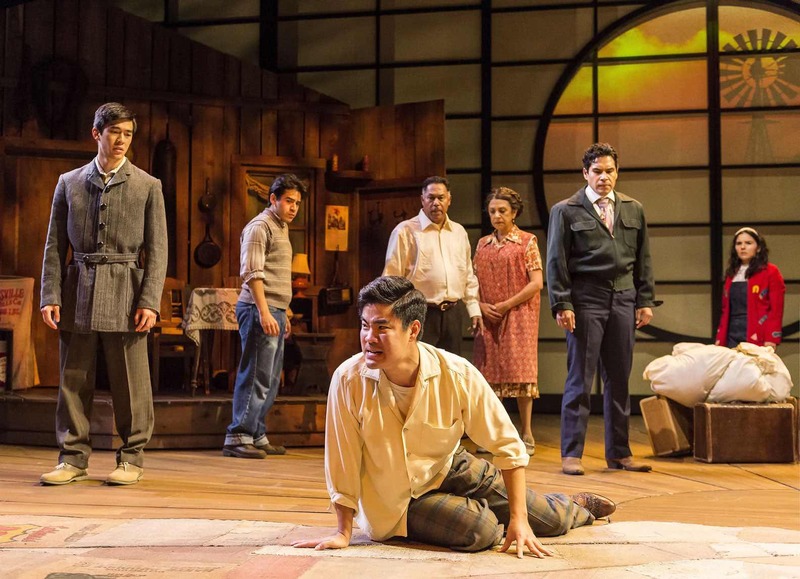 For the cast and audiences alike, doing the show has been a learning experience, Mah said. “We have all discussed how we are taught the bare minimum about Japanese American incarceration during WWII, and how our history books gave us about a paragraph describing these injustices. We live in the world of this play six days a week and are constantly learning about and living in the ugly truths of this dark period in our country’s history. There are constant discoveries and conversations happening among the cast members and production team about the past and present state of our country’s moral compass. “So far, we have been blessed to have had audiences who have been invested in our story from the moment the curtain goes up, or more specifically, when the shoji screens part. Many continue to tell us how much they learn from ‘Valley of the Heart’ in terms of the Japanese and Mexican Americans during WWII and they are ashamed that this is happening again in 2018. At the end of the play, an elderly Benjamin celebrates his birthday with Thelma, Maruca and a grown-up Benjirou (Takeda). This scene takes place the day before the 9/11 attacks. “This show reflects the cycle of humanity in both its beauty and its repugnance,” Mah explained. “We cannot have peace without war or good without evil. There will always be horrifying and inhumane events occurring around the world and we have yet to learn how to handle those events with decency and an awareness of past mistakes. “9/11 caused us to persecute anyone who resembled an inhabitant of a Middle Eastern country in the same way that the attack on Pearl Harbor resulted in the imprisonment of anyone with a drop of Japanese blood. I would love for audiences to understand that we have a habit of discriminating against different cultural groups when we are fearful, and it is happening again in 2018. The Mark Taper Forum is located at 135 N. Grand Ave. in Downtown Los Angeles. Remaining showtimes: Sunday, Nov. 18 and 25, Dec. 2 and 9, at 1 and 6:30 p.m.; Monday, Nov. 19, at 8 p.m.; Tuesday, Nov. 20 and 27, Dec. 4, at 8 p.m.; Wednesday, Nov. 21 and 28, Dec. 5, at 8 p.m.; Thursday, Nov. 29 and Dec. 6, at 8 p.m.; Friday, Nov. 23 and 30, Dec. 7, at 8 p.m.; Saturday, Nov. 17 and 24, Dec. 1 and 8, at 2:30 and 8 p.m. Stage Talks after performances on Nov. 20, Dec. 2 (matinee) and Dec. 4. A Community Conversation titled “Dignity Amidst Injustice: From Japanese American Internment to Today” will be held Nov. 28 at 6 p.m. at the Music Center Annex, 601 W. Temple St. RSVP required. Performance length is 2 hours, 45 minutes, with one intermission. Recommended for ages 10 and up; children 6 and under not admitted. Tickets range from $30 to $99. To purchase, visit the Center Theatre Group Box Office at the Ahmanson Theatre (adjacent to the Mark Taper Forum), call (213) 628-2772, or go to http://CenterTheatreGroup.org.